Late evening cravings led me to Carlos Cafe for some home delivered munchies. Some puffs, some burgers and some pastries were ordered! The cafe expects a min order of 250/- which is a bit unrealistic for a snacky place. The order was delivered in 30 mins and the food was value for money! Will order again! very nice. Courteous. I tried the mango chesse...and I swear I never had any like this b4. Slicky smooth cheesy piece it was.fresh and cool. Will try other items in coming days. 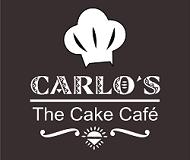 A Must try cake shop.